Aron Burton said to me, "the first thing they told me, when I sang in a choir; you have to look at people." That was his way to point out to me that I had to keep my eyes open when I sing. But I find that difficult. Sing the lyrics, play guitar and take the band in the rendition of the song. I have to concentrate well and there's no place for a distraction as eye contact. Some people love observing musicians playing music, others liked to be seduced to a party. How hard it is to find a balance. Tom Jones said in a documentary: "I was singing to my uncle. He taped me on the fingers and said; you have to look at me, because I like the way you sing." A kind of bravado is also needed. 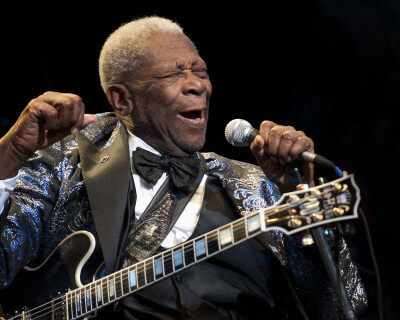 A video of B.B.King shows very beautiful, what a top artist does to get the public on his side. BB starts in a chaotic situation in prison on a performance. His band has yet to come up and settle. To fill the gap he communicates with the public The inmates call all kind of stuff. In this chaos the song should be given a place. BB starts with a long guitar solo. Then comes the moment when he must bring out the song inside. With his eyes closed BB brings his emotion and soul and gradually you see and hear the audience turn. In the end, he takes them all the way. Op de Blog-Archief-pagina staat de Nederlandse tekst.